While one purported video of the incident shows traders beating up ITBP officers and pelting stones, another shows security forces thrashing traders with rifles butts and bricks. 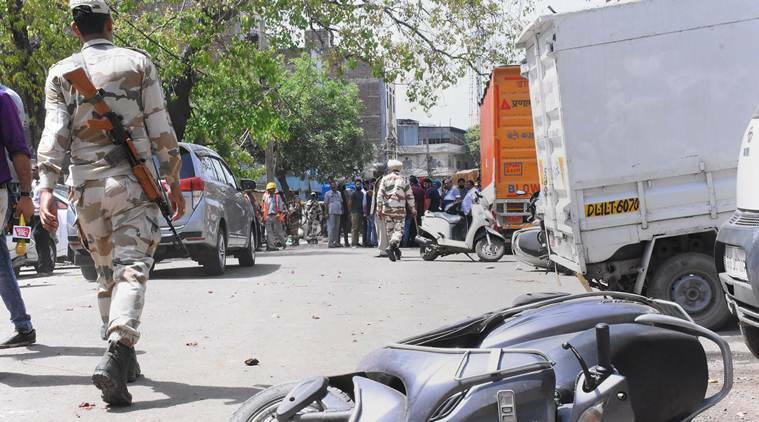 A sealing drive at west Delhi’s Mayapuri Industrial Area phase II took a violent turn Saturday morning as traders clashed with security forces. At least 14 officials, along with traders and scrap dealers, were injured. “The sub-divisional magistrate, a Delhi Pollution Control Committee (DPCC) engineer, a Delhi Police head constable, an ACP, a tehsildar, five officers of the Indo-Tibetan Border Police (ITBP) force and four civil defence officials were injured. A case is being registered,” said Anil Mittal, Additional PRO, Delhi Police. The sealing drive began in the area on the directions of the National Green Tribunal (NGT). By Saturday afternoon, remnants of the clashes could be seen in the lanes, home to factories of leather, steel and spare motor parts. Gurbaksh Singh (72) stood outside his steel fabrication factory carrying a DPCC notice dated April 12, 2019. “DPCC has approved to levy EDC of Rs 50,00,000,” the notice read. Between 9 am and 3 pm, 12 of the 312 units in the area, which has a sizeable Sikh population, were sealed. Outside Gurpreet Singh’s leather goods factory stood 25 labourers. “Some of them live in two rooms inside the factory and all their items of necessity are inside… I can pay them for a few days, but if the sealing is not revoked, they will have to find new jobs,” said Singh, claiming that all his DPCC certificates are in place. Following the violence, DCP (West) Monika Bhardwaj said she had on Friday “requested for extra armed forces equipped with anti-riot gear — helmet, lathi and shield”. On Friday night, a message had been conveyed to three police stations under Mayapuri sub-division to deploy 10 personnel each. But as violent escalated Saturday, a message was flashed about urgent deployment of police personnel from all police stations under West district to reach the spot.